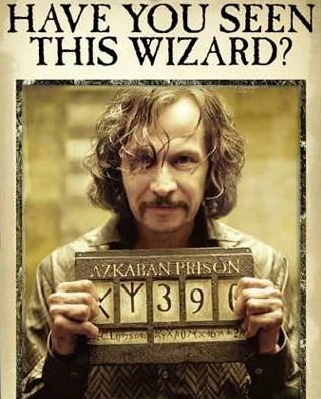 Azkaban is the prison for wizards who have done really bad deeds. We created an Azkaban in our home to prevent our otherwise “really good dog” from doing really bad deeds. Thank God (again) for Craigs List. 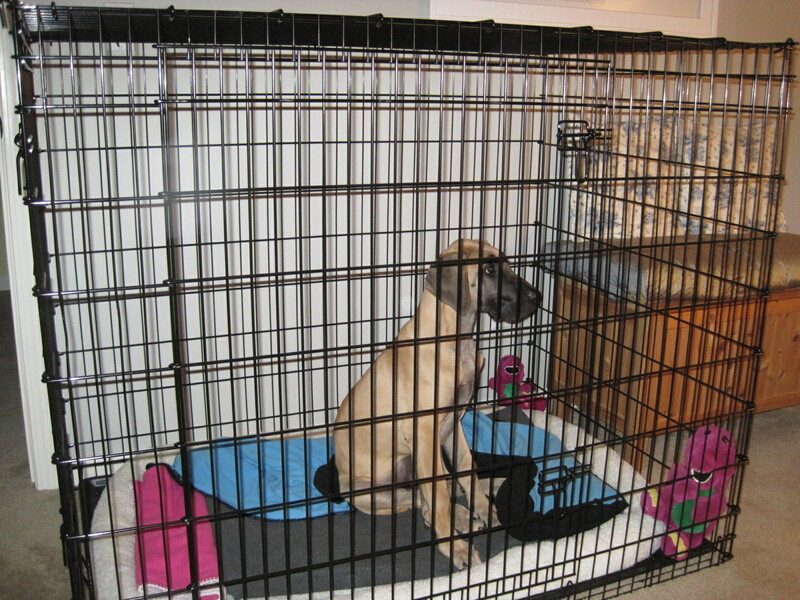 If it hadn’t come through, we wouldn’t be now able to sequester our Great Dane puppy Luna behind bars whenever necessary. But thanks to Craigs List and an electrician in San Jose who bought a really huge cage (XXL/giant breed size) for a really tiny dog (yorkshire terrier mix), we wouldn’t have scored such a deal on an otherwise expensive (read: $225+) addition to the Luna Budget. The short version is that this guy, whose previous dog was an akita, agreed when his wife suggested they get a yorkie mix. I don’t think he had a copy of the dog breed atlas handy. Otherwise, he’d have seen a picture and understood that a yorkie is not an akita. 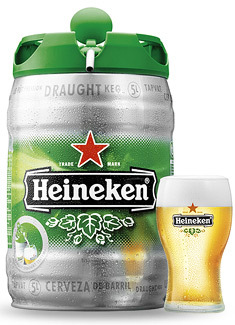 Yorkie’s never get even close to the size of a Heineken mini keg. He’d have understood that putting even a full-grown Yorkie in a 54” X 45” X 36” cage is like forcing your teenager to sleep alone in a high school gym. His wife got her wish and a tiny puppy. He bought a huge cage. He put it together. I can only guess what happened next; they put Bartie in the cage. Their beloved micro pounder got lost. He was probably lost for 30 min. They finally found him. Hubbie then disassembled the cage while his wife wrote the ad copy. We replied to it, gave him $120 and drove home with a huge box in the car. It was a bit of a struggle to bring it into the house. 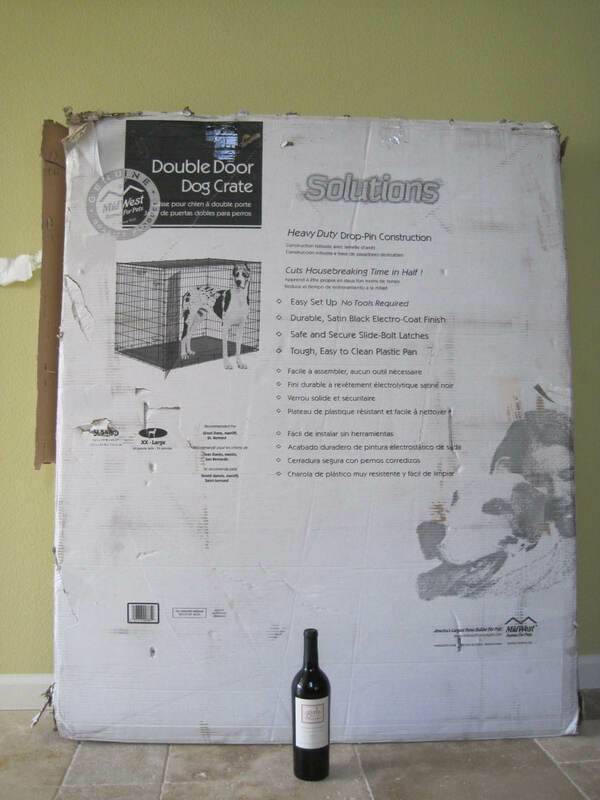 That’s a 750 ML wine bottle to give you some perspective of the size of the box. We set it up in our upstairs bedroom as a replacement for the travel kennel that’s served as the epicenter of Luna’s nights since her mid-January arrival. The cage comes with a plastic shell insert for the bottom that is so hard I wouldn’t even force Michael Vick, notable dog lover and professional athlete, to sleep on it. MW drove over to a local pet store chain and $65 later, our Azkaban gained a plush, faux sheep skin shell liner/bed that is more comfortable than anything Sirius Black ever slept on. Tossed in a couple of Barneys that, surprisingly, have retained their heads, and we ended up with a veritable McMansion infill 5 ft. from our sleigh bed. How Does the Infill Work? Luna’s spent 3 nights in her new home. She seems to love it. She’s started to sleep on her back with at least 3 paws stretched out in the air at any one time. She groans. She dreams and paws the night air. She is, apparently, oblivious to the double latches that are closed when she’s inside.